In this third Ravkan folk tale from Leigh Bardugo, a beautiful girl finds that what her father wants for her and what she wants for herself are two different things. 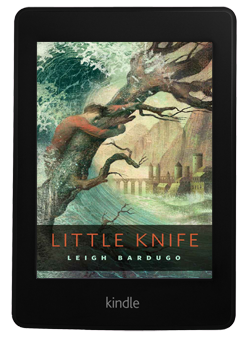 Little Knife is a beautifully told Ravkan folktale about a bewitchingly lovely young girl, an avaricious father, and a poor Tidemaker. When the girl’s father sets out three difficult task for his daughter’s suitors, the impoverished Grisha outcast, who’s been enchanted by the girl’s loveliness, calls upon the river to help win him a wife and wealth. I absolutely love Leigh’s style of storytelling in general, but particularly in these Ravkan fairytales. Her use of language is beautiful and her structure slightly (not to mention effortlessly) archaic. It gives this story the feeling of a much older tale while incorporating themes of respect and freedom that are simultaneously timeless yet also modern. There is always a balance between the wondrous and the truly horrific in Leigh’s folktales that I love; an element I’ve found to be shared by many of the older, less-sanitized versions of fairytales. And while these elements and themes are somewhat universal, Little Knife also serves to further develop and establish specifically a richer sense of Ravkan culture, history, and morality. Overall, Little Knife is a wonderful tale that rounds out this small companion trilogy of Ravkan folktales quite nicely. – Where does it fit? It’s listed between The Too-Clever Fox & Ruin and Rising, but it could be read as a standalone. – Prior Knowledge needed? No.